The most sought after toys on Force Friday II earlier this month, hands down, were the Porgs. Porgs were officially unveiled back in August in the D23 Expo behind the scenes reel (after first being revealed online by MakingStarWars.net). 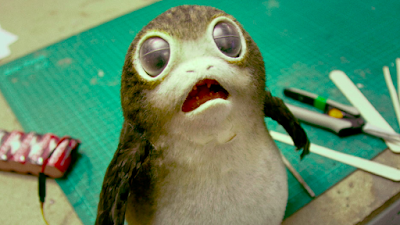 Since then Porgs have become a fan favourite that many can't wait to actually see on screen. Director Rian Johnson decided to share some more little details about the Porgs with a fan a Twitter. Johnson described the Porgs tweeting, "They are sea birds. Their coloring varies. Males are slightly larger than females. They can fly short distances. They're inquisitive." We'll see the Porgs in action when Star Wars: The Last Jedi hits theaters on December 15th. The film is written and directed by Rian Johnson and stars Daisy Ridley, Mark Hamill, John Boyega, Adam Driver, Carrie Fisher, Kelly Marie Tran, Laura Dern, Benicio Del Toro, and Lupita Nyong'o.